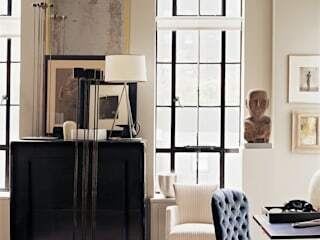 Thomas O’Brien established Aero Studios in 1992 as an interior design firm combined with a vintage furniture gallery and home furnishings store. In name and practice, Aero has always represented a twofold enterprise: Studio and Store together, distinctively housed together under one roof. Entering its third decade, Aero remains a fixture in New York City’s downtown Soho neighborhood. The company’s familiar banner on Broome Street is an emblem of Soho’s famed art gallery legacy, as one of the original home design brands in the area, and a destination for shoppers from around the city and the world. Fronting the Studio, the Aero Store presents the complete lifestyle collection of Thomas O’Brien products along with a hand-picked, ever-changing selection of elegantly refurbished vintage modern furniture, art, lighting, accessories, and one-of-a kind finds. The Studio is a master design office which encompasses three practice areas: Architecture, Interiors, and Product Design. Functioning in an interdisciplinary model, O’Brien encourages crossover among projects, where an antique can spur the creation of a newly designed object, or the refined millwork on a piece of furniture can inspire the structure of an entire room. For every project, large or small, O’Brien and his team work in a classical mode of inquiry, with research, sketching, rendering, presentation, critique, and revision through many rounds, until the ideal expression of every detail is uncovered. In Architecture and Interiors, O’Brien’s work is very diverse. Residential, commercial and corporate projects range from reconfigured lofts to formal apartments; historic country houses to new architectural additions and buildings; hotels to retail store design to executive offices. Commissions of note include the Manhattan home of Giorgio Armani; a 19th century rural estate in Connecticut; a classical Fifth Avenue prewar floor-through apartment; a refined cosmopolitan Central Park West apartment; a 1920’s Mediterranean property in Austin, Texas; O’Brien’s own 1833 Academy schoolhouse-turned residence on Long Island; interior architecture, decoration and garden design for a modernist beach compound in Bridgehampton, Long Island; and, the Soho boutique hotel 60 Thompson. O’Brien recently designed the vintage-modern interiors for the historic ten-building complex of The Greenwich Lane, a LEED-certified, luxury real estate development in New York’s Greenwich Village. In Product Design, the Studio is responsible for all of Thomas O’Brien’s extensive brand of licensed home furnishings, including lighting, furniture, table and giftware, textiles, carpets, and plumbing made in partnership with a range of American heritage companies. The Studio also oversees the limited editions of handmade leather goods, accessories, bedding, lamps and furniture that O’Brien designs exclusively for the Aero store.